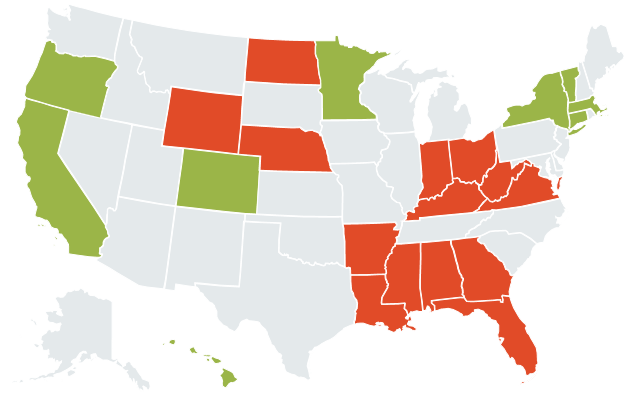 How does your state stack up on the road to a cleaner energy future? Spotlighting Green: Some key states that stand out for embracing renewable energy and adopting innovative programs, demonstrating that a cleaner energy future is within reach. Too Close to Call: Many have adopted renewable mandates or voluntary programs on par or even stronger than the EPA's goals, but still have a ways to go to make real progress. Lagging Behind: These states remain deeply dependent on the dirtiest fuels and have made little effort to pursue clean energy options. There is much residents can still do to demand clean energy and reverse this course. The Clean Power Plan sets different goals for each state to reduce its carbon emissions by 2030. As one pathway to meet those goals, the EPA suggests a renewable energy target for each state. 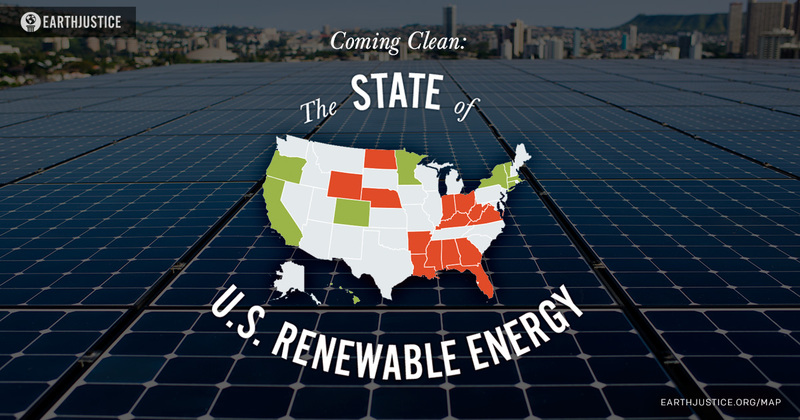 However, many of the states are already on track to meet or even exceed those renewable aims. See how your state stacks up on the road to a cleaner energy future. And take action today to help defend the finalized Clean Power Plan. Alabama has the lamentable credit of having the second dirtiest power plant in the country. Alabama Power Co.'s James H. Miller, Jr. Electric Generating Plant spews into the air the annual equivalent in emissions as 4.3 million passenger vehicles. Alabama is also one of 12 states that are suing the EPA for its plan to limit carbon pollution from coal-fired power plants. Bottom Line: Alabama is mired in fossil fuels, has no wind or solar installations, and no measured ambitions to build a renewable program. Alaska, the Last Frontier, had one of the most ambitious goals for renewable energy in the country: to reach 50% by 2025. However, that plan was nonbinding under the state's voluntary renewable portfolio standard. Bottom Line: While Alaska had set aggressive renewable energy goals, the goals are nonbinding, and there is no plan of action in place to ensure they are met. * A 50% goal by 2025 was nonbinding. In the 2009–2010 legislative session, the Alaska legislature enacted House Bill 306 with the goal that “the state receive 50 percent of its electrical generation from renewable energy sources by 2025.” This language does not appear in codified statutes. Arizona ranks 2nd in the nation in installed solar capacity and offers a Solar Energy Credit to taxpayers who install a solar or wind energy device at their home. Yet in 2013, the state passed an ALEC-sponsored bill to charge a monthly fee for rooftop solar owners to connect to the grid. Bottom Line: While Arizona produces a sizable amount of solar energy, it still receives more than half of its energy from fossil fuels and is one of only eight states whose power-sector carbon emissions rose between 2005 and 2012. Arkansas had the largest increase in emissions of any state, going up by 35% between 2005–2012, while all but seven other states reduced emissions. The state's great solar and wind energy potential remains largely untapped even though it could provide a boon in job and economic growth, reminding us that Arkansas wasn't once called the Land of Opportunity for nothing. Bottom Line: Arkansas has a lot of potential, but very little clean energy ambition. The Golden State gets a gold star for its leadership in the field of renewable energy, ranking 3rd in the country in wind and 1st for its installed solar capacity. Since 2012, California has propelled forward on clean energy. In 2013 alone, the state increased its wind generation by 37% and more than doubled its total solar capacity over its 2012 numbers. Bottom Line: California is a renewable energy powerhouse, leading the pack down the path to a cleaner energy future. Earthjustice at Work: In 2012, Earthjustice's advocacy contributed to the California Public Utilities Commission's decision to prioritize clean energy in 10-year procurement plans for Southern California. In another case, we helped persuade California to require energy storage systems that can expedite the transition to clean energy. We are currently working to secure demand-response goals. The organization continues to advocate for increased installation and use of renewable energy and energy storage, and continues to promote rules that maximize the use of demand-response to meet the state's energy needs. Colorado has an aggressive renewable energy standard that has previously come under industry fire, but which Earthjustice successfully defended. The state also has a program that authorizes counties and towns to offer property or sales tax rebates and credits to property owners who install renewable energy systems on their buildings. In 2013, Colorado brought online significant solar resources and announced the creation of the largest solar facility east of the Rockies. The state has also made moves to advance some major projects to increase its wind generation. Bottom Line: Colorado is a major producer of renewable wind energy, has aggressive renewable energy goals, and is experimenting with innovative programs to ensure that renewables can thrive in the state. Earthjustice at Work: Representing Vote Solar, we are advocating for a proper valuation of solar energy resources, fair compensation to small-scale solar distributed facilities and expansion of customer opportunities to go solar. * 30% by 2020 for investor-owned utilities; 20% by 2020 for large electric co-operatives; 10% by 2020 for other cooperatives and municipal utilities serving more than 40,000 customers. The Nutmeg State has embraced renewable energy for all by offering Energy Conservation Loans to provide financing for the purchase and installation of cost-saving energy conservation improvements at below-market rates to property owners. And in 2013, the state powered up its first utility-scale solar farm. Yet, even heavily Democratic Connecticut is not immune to Koch Bros-funded ALEC shenanigans. In 2013, lawmakers introduced four ALEC-sponsored bills to weaken the state's renewable Portfolio Standards. One of the four passed. Bottom Line: Connecticut has set aggressive renewable energy goals to wean off its fossil fuel dependence. The Small Wonder has set renewable energy goals more than twice as aggressive as the EPA would require it to meet. The federal government has issued leases for a wind farm off the Delaware coast. Bottom Line: Though Delaware has aggressive renewable energy goals, the state relies almost exclusively on power produced from fossil fuels and biomass, which emits harmful pollutants into the air. * Requirement of at least 3.5% solar photovoltaic. The so-called Sunshine State is lagging in its move to a cleaner energy future and has a ways to go to live up to its nickname. It ranks 7th in the nation in net generation from large-scale solar energy. Bottom Line: Florida has failed to take advantage of one of its most abundant resources, sunlight, and relies heavily on fossil fuels and nuclear power, which creates radioactive waste, to meet its energy demands. Earthjustice at Work: Earthjustice is pushing for energy efficiency and distributed generation to meet the state's growing energy needs rather than falling back on fossil fuels. The state's current clean energy outlook is not so peachy. Georgia has the lowly distinction of being home to the dirtiest power plant in the U.S. Owned by Georgia Power Co., the plant emits the carbon equivalent of 4.4 million cars per year. Still, the Peach State managed to cut its emissions by 35% between 2005–2012. Those emissions reductions are largely attributed to Georgia's transition from one fossil fuel, coal, to another, natural gas. One bright spot for the state is that it has increased its solar development in the past few years, slowly moving in the right direction. Bottom Line: Georgia has leaned completely on fossil fuels and nuclear power with no ambitions to clean up its act. Hawaiʻi, though heavily reliant on petroleum, is slowly weaning off fossil fuels and saying aloha to clean energy. It has adopted ambitious clean energy goals, and its Green Energy Market Securitization program provides a "green bank" for financing customer-based solutions like rooftop solar and energy efficiency. Since 2012, Hawaiʻi has leaped forward in expanding its solar power. In 2013, it added enough solar capacity to rank it 6th nationally in solar power. And as of 2013, more than 1 in 9 homes in Hawaiʻi have installed solar. Bottom Line: Hawaiʻi has been making leaps and bounds in its solar development. Earthjustice at Work: We challenged utility plans to maintain a business-as-usual approach for its dirty fossil-fueled fleet, leading the state's Public Utilities Commission to reject the plans and recommend sweeping changes to create a customer-focused, clean energy utility of the future. In several ongoing cases, we're advocating for performance-based incentives for utilities to reduce use of fossil fuels and accelerate adoption of clean energy, removing barriers to renewable energy, and promoting solutions for higher renewable energy penetration. We're also supporting a comprehensive on-bill repayment program to promote customer-installed clean energy by allowing consumers to pay for improvements via their electric bill over time. * 30% by 2020; 40% by 2030; 70% by 2040; 100% by 2045. Idaho lacks independent clean energy goals, yet has the lowest power-sector emission rate in the country. The state has made huge strides toward harnessing its renewable resource potential, increasing wind generation by nearly 35% in 2013. Bottom Line: Idaho produces very little carbon emissions, yet it relies predominantly on massive dams, which have adverse effects on river ecosystems. Ideally, the state would diversify its renewable energy mix. The Land of Lincoln is moving toward achieving more than a quarter of its energy from renewable sources. Through programs such as Energy Impact Illinois, which partners with local banks and credit unions to provide low-interest loans to help reduce the upfront costs, the state is getting greener. Bottom Line: Illinois has aggressive renewable energy goals, but it still relies almost exclusively on energy produced from dirty coal plants and nuclear plants, which produce radioactive waste. The Hoosier State is also home to the 6th-dirtiest power plant in the country, owned by Duke Energy, and it's one of 12 states challenging the EPA's Clean Power Plan in court. Despite this, it still has more aggressive clean energy goals than the EPA is asking of it. The Indiana State House passed a bill in 2013 to end its energy efficiency resource standards. Bottom Line: Recent actions by the Indiana legislature show it is moving away from its path to a clean energy future, and the state receives more than three-quarters of its energy from dirty coal-fired power plants. Earthjustice at Work: We're working to address barriers to net metering and distributed generation growth in the state, we've negotiated a binding commitment for the retirement of Unit 4 of the Tanners Creek coal plant in 2015, and we're advocating for increased pursuit of renewable resources. Earthjustice is also engaged in utilities' 20-year planning processes to advocate for increased investment in energy efficiency and clean energy resources, rather than continued spending on aging and dirty coal infrastructure. In 2013, we challenged Indianapolis Power & Light's proposed retrofits to coal plants as being uneconomic, which led IP&L to reconsider its plan to retrofit Unit 7 of the Harding Street coal plant in Indianapolis. IP&L has now announced its intent to stop burning coal at that plant, thereby making Indianapolis coal-free! As one of only eight states with energy emission increases in recent years, Iowa remains deeply reliant on coal. Despite this, it is among the leading states in wind power generation with more than 5,100 MW of wind capacity installed by the end of 2013. Bottom Line: Iowa is making great advances with wind energy development, but it is still wedded to fossil fuels. * Investor-owned utilities must combined have 105 MW of renewable resources by 1999. Fossil fuel interests led by the Heartland Institute worked to repeal Kansas' renewable energy standard through the entire legislative session in 2014, but were defeated every time. The state's fossil fuel interests did compel the state, however, to join 11 other states in suing the EPA over the Clean Power Plan. Despite that, Kansas has the 2nd-highest wind energy potential in the country and could be doing much more to harness that energy instead of fighting carbon limits. Bottom Line: Despite having renewable energy goals and producing a relatively high amount of wind energy, Kansas still relies heavily on energy produced by dirty coal power plants. * The state's investor-owned utilities and electric cooperatives must generate or purchase 20% of the affected utility's peak demand from eligible renewable resources for each year beginning in 2020. While the vast majority of its energy is generated from coal, Kentucky enacted legislation in 2008 establishing a 30% state income-tax credit for certain solar, wind, and geothermal installations on single or multi-family residences and on commercial property. This incentive is cold comfort, though, because this state is joining the charge against the EPA for proposing carbon limits for power plants. Bottom Line: Kentucky is the 2nd most coal-reliant state in the nation, and the state has no renewable energy goals. Earthjustice at Work: We defeated the proposed $960 million retrofit of Unit 2 of the Big Sandy coal plant, which will instead be retired in 2015, thereby preventing more than 6 million tons of carbon emissions per year. We also negotiated investments in energy efficiency and evaluation of wind as part of the plan to replace Big Sandy. Across a multitude of cases, Earthjustice is advocating for the retirement of five uneconomic coal plants, pressing utilities to complete studies on energy efficiency potential, and urging increased pursuit of energy efficiency, demand-response, wind, solar, and distributed generation as least-cost/least-risk alternatives for meeting energy needs over the next 15 years. With its rich delta soil, the Bayou State is home to an abundance of crude oil and is one of the top producers of natural gas in the country with nearly one-tenth of the nation's natural gas reserves. It has among the highest per capita electricity sales in the nation and is one of only eight states that saw emissions go up between 2005–2012. It's no surprise that a state so controlled by fossil fuel interests would have nearly no renewable energy generation. The state has joined with 11 other states to challenge the Clean Power Plan in courts. Bottom Line: Louisiana relies on dirty energy sources and lacks any plan for incorporating renewables into its future energy mix. The Pine Tree State has set out to achieve aggressive emission reductions and leads New England in wind power generation. Over the period of 2005–2012, Maine nearly cut its carbon emissions in half. There's been some pushback to progress, however. In 2013–14 the governor pushed to weaken the state's renewable energy standards and eliminate incentives for clean energy. Maine generates much of its electricity from biomass: from the burning of wood and wood waste and agricultural residues. While considered by some to be a renewable energy source, a utility-scale biomass plant has 150% higher carbon dioxide emissions than those of a coal-burner, and 300%–400% higher than those of a natural gas facility. Bottom Line: While it has set aggressive renewable energy goals, Maine relies primarily on hydro and biomass sources, which both have negative environmental impacts, to meet them. The state's EmPOWER Maryland Low Income Energy Efficiency Program helps qualifying low-income residents increase the energy efficiency of their homes at no cost to program participants. The Maryland Offshore Wind Energy Act passed in 2013 and encourages offshore wind development. Bottom Line: Maryland has instituted an important climate justice project and set aggressive renewable energy goals, but it is still heavily dependent on dirty fossil fuels. Earthjustice at Work: We are intervening in Maryland's EmPOWER proceedings to ensure that the state taps the full potential for significant energy savings through energy efficiency, particularly with traditionally underserved low-income communities and multi-family housing units. Recent News: Solar Ambitions: All of Maryland will benefit from one man’s quest to bring solar power into his own community. The Bay State made a whopping 47% reduction in carbon emissions from power plants in recent years and looks to stay on track as host to the first federally-approved offshore wind project, Cape Wind. Massachusetts also has a long list of incentive programs to invest in renewable energy. In 2013, the state installed enough solar energy capacity to rank it 4th nationally in solar. Bottom Line: Massachusetts offers one of the widest ranges of renewable energy incentives in the nation and had the 3rd largest reduction of carbon emissions in the power sector from 2005–2012. * New resources require 15% renewable by 2020 and an additional 1% each year after. Resources in operation prior to 1997 required 7.1% renewable by 2009. While it does have more aggressive clean energy goals than the EPA calls for and specific new capacity goals for utilities that serve more than 1 million customers, the Mitten State has yet to put a cap on the 9th-dirtiest power plant in the U.S. Owned by Detroit Edison Co., the plant emits the carbon equivalent of 3.4 million cars per year. Bottom Line: Michigan is making strides toward a clean energy future, but needs to put a cap on its dirty power plants. Earthjustice at Work: Through a series of cases, Earthjustice is working to require coal plants in Michigan to comply with environmental standards and advocated for shifting utility investments away from aging coal plants and toward renewable resources. After Consumers Energy recently committed to retiring seven of its coal units, we successfully challenged the company's plan to replace those units with a new natural gas plant, urging the use of existing capacity and increased energy efficiency and renewable resources instead. * Two utilities are required to reach additional renewable capacity goals by 2015. The state is requiring more ambitious renewable energy goals of its top utilities than the EPA is seeking. The North Star State is among the top 10 nationally in net electricity generation from wind, even though ALEC members tried to repeal the state's renewable energy standards to no avail. Bottom Line: Minnesota is making great strides toward a clean energy future. * 31.5% by 2020 for Xcel, 26.5% by 2025 for other investor-owned utilities, 25% by 2025 for all other utilities. While the Hospitality State hasn't been particularly hospitable to the idea of weaning off fossil fuels, the state does offer low-interest loans for renewable energy and energy efficiency projects. Bottom Line: Mississippi has yet to set any renewable energy goals—it relies solely on fossil fuels and nuclear energy. The state legislature considered an ALEC-modeled bill that would have watered down the renewable portfolio standards and effectively eliminated incentives for increasing renewable energy in the state. It failed to pass. Missouri is home to the 4th-dirtiest power plant in the U.S.: Union Electric Co.'s Labadie Power Plant, which emits the carbon equivalent of 3.9 million cars per year. Bottom Line: While Missouri is fairly dependent on fossil fuels, it has set relatively aggressive renewable energy goals, in comparison to neighboring states. Earthjustice at Work: We reached an agreement with Kansas City Light & Power that will significantly increase the utility's investment in energy efficiency and prevent nearly 101,000 tons of carbon dioxide pollution. We are also actively involved in integrated resource planning for the two biggest utilities in the state to urge increased investment in energy efficiency and renewable resources and the retirement of uneconomic coal units. * In addition, 0.3% of retail electricity must come from solar by 2021. The 3rd-least densely populated state, Montana is a net supplier of energy to the nation, producing both fossil fuels and renewable energy. Montana holds more than one-fourth of the nation's estimated recoverable coal reserves. The state has set a more aggressive goal on renewable energy than the EPA is proposing and could achieve that goal with such great wind-power potential. The legislature tried to modify the state's renewable energy standards by adding existing hydropower, but the governor vetoed the bill. Bottom Line: Montana prioritizes its heavy output of coal, which continues America's addiction to dirty fossil fuels. Earthjustice at Work: We are seeking to highlight the expense and unreliability of dirty energy from Montana's Colstrip coal-fired power plant by challenging NorthWestern Energy's efforts to recover the cost of addressing a recent six-month outage at the plant after a major equipment malfunction. This case will help demonstrate that coal is neither a cheap nor reliable alternative to cleaner energy sources. The Cornhusker State had the third largest increase in power-sector carbon emissions from 2005–2012. The state remains deeply tied to its coal and nuclear power generation, even though the National Renewable Energy Laboratory estimates that nearly 92% of Nebraska has suitable conditions for wind-powered electricity generation. Instead of working to realize its potential, it is suing the EPA over the Clean Power Plan. Bottom Line: Nebraska has failed to fully exploit its high wind-power potential and has set no renewable energy goals. Nevada reduced its emissions dramatically between 2005–2012 by decreasing carbon emissions from the power-sector by 43%. NV Energy is providing an incentive for its residential customers to install solar water heaters in their homes. Bottom Line: Nevada has cut its carbon emissions significantly, but it still gets more than three-quarters of its energy from fossil fuels. The Granite State tied with Maine for 2nd-largest reduction of carbon emissions in the power sector from 2005–2012 (48%) and is set to meet the EPA's target for renewable energy five years ahead of schedule. Bottom Line: Despite significantly cutting its carbon emissions, New Hampshire relies almost exclusively on energy produced from fossil fuels and nuclear plants. The Garden State has been steadily marching toward a cleaner energy future, ranking 3rd in the U.S. in installed solar capacity. New Jersey offers a full exemption from the state's sales tax for all solar energy equipment. Bottom Line: Despite being one of the top states for solar, almost all of New Jersey's energy comes from fossil fuels and nuclear plants. * An additional 4.1% solar by 2027. Much of New Mexico gets 300 or more days of sunshine annually, giving the state some of the nation's best solar energy potential. Bottom Line: Despite setting renewable energy goals, New Mexico has failed to take advantage of its huge solar potential and continues to rely predominantly on dirty coal power. * 20% by 2020 for investor-owned utilities, 10% by 2020 for co-ops. The Empire State has ambitious goals to transition to clean energy, aiming to hit 29% renewables by 2015. The state also made major reductions in emissions from the power sector between 2005–2012, dropping by 42%. However, New York is a battleground, with the state vying to bring three dirty coal-fired power plants back online. Bottom Line: New York almost cut in half its carbon emissions from the power sector from 2005–2012 and has set one of the most aggressive renewable energy goals in the country. Earthjustice at Work: We're working to retire two uneconomic coal-fired power plants (Dunkirk and Cayuga plants) and advocating for low-cost alternatives. Earthjustice is also bringing its extensive PUC experience to New York to compel utilities to operate in genuinely new ways to scale up reliance on distributed clean energy resources. In the face of significant opposition from Earthjustice and its allies, the new owners of the Danskammer plant have committed to not burning coal at the soon-to-be reactivated plant, which was shut down in October 2012. North Carolina cut a quarter of its emissions from the power sector between 2005–2012. It is home to the NC Clean Energy Technology Center, a policy and research center helping to advance clean energy in the state. However, the state's clean energy future is jeopardized by a push from ALEC and Duke Energy to reduce how much households are paid for generating electricity from solar panels. Bottom Line: North Carolina has made some progress with renewables, but it is still wedded to dirty fuel sources. * 12.5% by 2021 for investor-owned utilities, 10% by 2018 for municipal and co-op utilities. North Dakota is a leader in wind energy generation, but it's also still heavily reliant on coal. It is also at the epicenter of the latest dirty energy boom: fracking. Bottom Line: North Dakota is reliant on fossil fuels and has set low goals for renewable energy, even though it already exceeded its own goals by generating 15% of its energy in 2012 from wind. The Buckeye State has become a battleground where the fossil fuel industry has been spreading false information and flawed analysis claiming renewable energy sources are more expensive than fossil fuels. The state was on track for a clean energy future, but was derailed in 2014 by a bill that halts Ohio's renewable energy standards for two years. Unfortunately, Ohio has also joined 11 other states in suing the EPA to block the Clean Power Plan. Bottom Line: Ohio can serve as a cautionary tale of the power of dirty energy interests successfully halting its clean energy progress. Earthjustice at Work: Earthjustice has recently stepped up to challenge proposals by Ohio utilities that would require customers to bail out and economically support for the next 15 to 35 years a series of financially struggling coal plants throughout the state. We also negotiated a binding commitment for the retirement of Unit 5 of the Muskingum River coal plant in 2015 and are challenging the permit for a proposed coal gasification facility in the state. * Senate Bill 310 (2014) creates a two-year freeze on the state's standard while a panel studies the costs and benefits of the requirement. The good news: In 2013, Oklahoma ranked 4th in net electricity generation from wind, which provided almost 15% of the state's net generation. The bad news: A 2014 bill cosponsored by an ALEC state legislator allowing utility companies to charge customers who install solar (or wind turbines) an additional fee was signed into law. Safe to say these same interests compelled the state to attempt to block the Clean Power Plan through a lawsuit against the EPA. Bottom Line: Oklahoma could be a leader in wind and solar production, but it needs to stop laying down barriers to clean energy backed by dirty fossil fuel interests. From 2007 through the end of 2012, electricity generation from renewable resources more than tripled. In 2013–2014, ALEC members tried to water down the renewable energy standards by including hydropower into the mix. Their attempts failed. Today, Oregon boasts one of the largest wind farms in the United States. Bottom Line: Oregon has low carbon emissions and aggressive clean energy mandates. * 25% by 2025 for large utilities and between 5%–10% by 2025 for smaller utilities. The Keystone State is home to the 8th-dirtiest power plant, owned by FirstEnergy Generation Corp., which emits the carbon equivalent of 3.4 million cars per year. In 2013, ALEC members sponsored a bill that would have included natural gas in the renewable portfolio standards. The bill died. The state's Pollution Prevention Assistance Account offers low-interest loans to help small businesses implement energy efficiency and pollution-prevention projects. Bottom Line: Pennsylvania is making strides for a cleaner energy future, but it is still solidly stuck on fossil fuels. Rhode Island had a whopping 30% increase in carbon emissions between 2005–2012, yet it is only one of two states with no coal-fired electricity generation. Though limited by its size, Rhode Island has ambitious goals to reduce its reliance on fossil fuels. Bottom Line: While Rhode Island has ambitious goals for clean energy, it has been slow to harness its potential, especially with wind energy. While the Palmetto State has no current renewables, there is hope. In summer 2014, the state passed a bill to encourage solar energy installation. The governor said she hopes the new bill will allow South Carolina to compete with other states in the region, which she believes have gotten a headstart when it comes to solar energy. On the other hand, the governor has joined the state in a lawsuit against the EPA to block the Clean Power Plan. Bottom Line: South Carolina has been stuck on fossil fuels, but it is looking to improve its clean energy game. Still, it has much more work to do. South Dakota offers loans to nonprofits, schools, and government agencies to pay for energy audits, energy efficiency improvements, and renewable energy installations. It is a leader in wind generation. Its renewable energy potential has not stopped it, unfortunately, from suing to block the Clean Power Plan. Bottom Line: While almost 90% of South Dakota has been identified as suitable for wind development, its renewable energy goals are comparatively lackluster. A program offers nonprofit organizations with below-market loans for energy efficiency and renewable energy improvements. For an Appalachian state, it has relatively low reliance on coal for power generation. Bottom Line: Tennessee has made some effort to embrace renewables, but it has yet to set any clean energy goals and relies primarily on energy from dirty coal-fired plants and nuclear plants, which produce radioactive waste. Texas, famously rich in oil, is also the #1 producer of wind energy in the U.S. Still, it has the lowly distinction of being home to the 3rd- and 5th-dirtiest power plants in the country, which emits the carbon equivalent of 7 million cars per year. A bill is pending that would eliminate the renewable portfolio standard and strip the Public Utilities Commission of its authority to regulate trading of renewable energy credits. Bottom Line: Texas is still married to its historical fossil fuel dependence, despite the state's great advancements in wind power generation. * 10,000 MW by 2025 (goal); 5,880 MW by 2015. A federal environmental study has cleared three areas of Utah for large-scale solar development. Meanwhile, the state also passed an ALEC-backed bill to allow utilities to charge solar customers additional fees. Utah generates more electricity than it consumes and is a net-power supplier for neighboring states. Bottom Line: Utah is squandering its potential for clean energy development due to political pushback from fossil fuel groups. The Green Mountain State is indeed very green, so much so that the EPA has excused it altogether from the Clean Power Plan since the state has no reliance on fossil fuel power plants. The state aims to source a whopping 90% of its total energy—including electricity, heating, and transportation—from renewable resources by 2050. Bottom Line: Vermont leads the nation in pursuing a clean energy future. * 55% by 2017 and 75% by 2032. Vermont is exempt from the Clean Power Plan because it doesn't have any fossil fuel power plants. Incentives to participate in this state's voluntary renewable portfolio standard program were eliminated in 2014, and the state has been a laggard on efficiency measures. Yet, the state is trying to up its clean energy game, enacting in 2010 a Green Jobs Tax Credit that offers tax breaks to companies that create more green jobs. Bottom Line: Virginia is stuck on fossil fuels and making little headway in achieving its voluntary statewide efficiency goal, proving the argument that voluntary goals are often the hollowest kind. * Investor-owned utlities are held to 12% by 2022 and 15% by 2025. The Evergreen State had the greatest reduction in power-sector carbon emissions between 2005 and 2012. State legislation requires the retirement of the state's only coal-fired power plant by 2025, which will decrease in-state emissions even further, but Washington still relies on coal-fired power produced out-of-state. In 2006, Washington enacted the Energy Independence Act, a state law that increases reliance on energy efficiency and renewable energy (other than hydropower), and Washington utilities are increasing their reliance on conservation and energy efficiency in response. While Washington leads the nation in electricity generation from clean energy, the state's major energy source is hydropower, which negatively impacts aquatic ecosystems and endangered species. Washington's targets for solar, wind, and other less harmful renewable resources are not as strong as some states', and utilities in Washington have resisted policies that encourage rooftop solar generation. Bottom Line: Washington leads in renewable energy generation, but it is deeply reliant on hydropower, which is destructive to ecosystems and has created barriers to other clean energy advancements. Earthjustice at Work: We established mechanisms that will allow Puget Sound Energy to boost energy efficiency savings, address the energy needs of low-income communities, and transition away from coal. * 9% by 2016 and 15% by 2020. West Virginia is literally made of coal, so it's no surprise it is the state most reliant on coal as an energy source. The state has fought against federal efforts to clean up the coal industry's pollution and has made little effort to move to cleaner energy sources. West Virginia is one of 12 states fighting carbon limits for coal-fired power plants in a lawsuit against the EPA. Though it has a voluntary renewable portfolio standard, the state allows the use of a wide variety of dirty and non-renewable technologies to meet the requirement, such as advanced coal technology, coalbed methane, natural gas, fuel from coal gasification or liquefaction, synthetic gas, integrated gasification combined-cycle technologies, waste coal, tire-derived fuel, and more. Bottom Line: West Virginia is heavily reliant on fossil fuels, and instead of taking serious steps to transition to clean energy it has been fighting coal pollution controls and insisting on coal industry exemptions. In 2013, ALEC members sponsored a bill to eliminate the state's renewable portfolio standard. The bill did not pass, and the goals for clean energy remain mandatory. Bottom Line: Though Wisconsin remains deeply reliant on fossil fuels, it is making strides toward a cleaner energy future with its mandated goals for renewables. Wind installations have increased rapidly in recent years and a number of large-scale projects are in development. One such project at Chokecherry-Sierra Madre is on track to become the largest wind project in the nation. However, Wyoming is also now the largest coal-producing state in the nation. The coal industry's influence on this state's policies has been tremendous, and Wyoming is one of 12 states suing to block the Clean Power Plan. Bottom Line: Wyoming is predominantly powered by dirty coal and has yet to set any renewable energy goals. ALEC (American Legislative Exchange Council) is a conservative group that connects state lawmakers with corporations to draft model state legislation. It is known for its links to anti-renewable energy campaigns and its attempts to roll back or undo environmental protection laws already on the books. With the exception of Vermont, which is exempt because it doesn't have any fossil fuel power plants. The electricity source data for each state is based on 2013 U.S. Energy Information Administration data, which does not account for significant advancements in solar and wind power development in the past two years. To adjust for this, in the state descriptions, we have detailed notable advancements in the years since. Whether it had adopted programs for climate justice. First published November 14, 2014. Updated on July 22, 2015. Notes: The electricity source data for each state is based on 2013 U.S. Energy Information Administration data. It does not account for significant advancements in solar and wind power development in the past two years. To adjust for this, we have detailed notable advancements in the years since in the state descriptions. Energy from biomass and nuclear are sometimes considered renewable energy; however, here they have been discounted due to their problematic nature. Biomass comes from sources that are mostly unsustainable and increase climate change pollution. Nuclear energy is reliant on the mining of uranium, a finite resource, and outputs radioactive waste. Percentages may not add up to 100 due to rounding. What's Wrong With Hydropower? In addition, we haven't included hydropower as a preferred renewable resource. Conventional hydropower is one of the oldest and most well-established among a growing number of technologies that provide low-emissions alternatives to fossil fuel energy. However, dams also cause considerable harm to rivers, as well as to local communities. Dams have depleted fisheries, degraded river ecosystems, and diminished recreational and economic opportunities on rivers across the nation. Irrigation, dredging, and hydropower operations have made some rivers virtually uninhabitable for many species. Learn more at Coming Clean: Hydropower’s Dirty (Energy) Secrets. Sources: Database of State Incentives for Renewables & Efficiency; Energy & Policy Institute; Environment America; Environment and Energy Publishing; Environmental Protection Agency; Federal Register; Georgetown Climate Center; National Association for the Advancement of Colored People; National Conference of State Legislatures; Union of Concerned Scientists; U.S. Energy Information Administration. Icons: Sun designed by Adam Whitcroft; Wind designed by Callum Taylor for The Noun Project. Help advance real climate action by sharing this feature with your friends and networks. #ActOnClimate! Coordinated in partnership with the Alliance of Nurses for a Healthy Environment, Creation Justice Ministries, Green Latinos, Hip Hop Caucus and Physicians for Social Responsibility.